Concentrations of platinum group elements (PGE), Ag, As, Au, Bi, Cd, Co, Mo, Pb, Re, Sb, Se, Sn, Te, and Zn, have been determined in base metal sulfide (BMS) minerals from the western branch (402 Trough orebodies) of the Creighton Ni–Cu–PGE sulfide deposit, Sudbury, Canada. The sulfide assemblage is dominated by pyrrhotite, with minor pentlandite, chalcopyrite, and pyrite, and they represent monosulfide solid solution (MSS) cumulates. 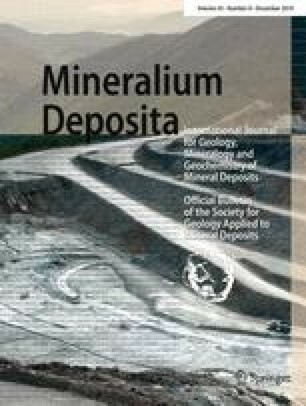 The aim of this study was to establish the distribution of the PGE among the BMS and platinum group minerals (PGM) in order to understand better the petrogenesis of the deposit. Mass balance calculations show that the BMS host all of the Co and Se, a significant proportion (40–90%) of Os, Pd, Ru, Cd, Sn, and Zn, but very little (<35%) of the Ag, Au, Bi, Ir, Mo, Pb, Pt, Rh, Re, Sb, and Te. Osmium and Ru are concentrated in equal proportions in pyrrhotite, pentlandite, and pyrite. Cobalt and Pd (∼1 ppm) are concentrated in pentlandite. Silver, Cd, Sn, Zn, and in rare cases Au and Te, are concentrated in chalcopyrite. Selenium is present in equal proportions in all three BMS. Iridium, Rh, and Pt are present in euhedrally zoned PGE sulfarsenides, which comprise irarsite (IrAsS), hollingworthite (RhAsS), PGE-Ni-rich cobaltite (CoAsS), and subordinate sperrylite (PtAs2), all of which are hosted predominantly in pyrrhotite and pentlandite. Silver, Au, Bi, Mo, Pb, Re, Sb, and Te are found predominantly in discrete accessory minerals such as electrum (Au–Ag alloy), hessite (Ag2Te), michenerite (PdBiTe), and rhenium sulfides. The enrichment of Os, Ru, Ni, and Co in pyrrhotite, pentlandite, and pyrite and Ag, Au, Cd, Sn, Te, and Zn in chalcopyrite can be explained by fractional crystallization of MSS from a sulfide liquid followed by exsolution of the sulfides. The early crystallization of the PGE sulfarsenides from the sulfide melt depleted the MSS in Ir and Rh. The bulk of Pd in pentlandite cannot be explained by sulfide fractionation alone because Pd should have partitioned into the residual Cu-rich liquid and be in chalcopyrite or in PGM around chalcopyrite. The variation of Pd among different pentlandite textures provides evidence that Pd diffuses into pentlandite during its exsolution from MSS. The source of Pd was from the small quantity of Pd that partitioned originally into the MSS and a larger quantity of Pd in the nearby Cu-rich portion (intermediate solid solution and/or Pd-bearing PGM). The source of Pd became depleted during the diffusion process, thus later-forming pentlandite (rims of coarse-granular, veinlets, and exsolution flames) contains less Pd than early-forming pentlandite (cores of coarse-granular). The online version of this article (doi: 10.1007/s00126-010-0295-6) contains supplementary material, which is available to authorized users. We would like to thank Vale Inco for partially funding the project and for their approval for publication; the technical support from Creighton Mine and the Exploration groups from Vale and Vale Inco for their assistance and cooperation; D. Savard and R.A. Cox for their support with whole rock and LA-ICP-MS analyses; P.C. Fisher for his help with the SEM analyses; J. Brenan of the University of Toronto for providing sulfide standards for LA-ICP-MS analyses; P.C. Lightfoot for his comments on the pre-submitted manuscript; J.M. Brenan and L.J. Cabri for their constructive and insightful reviews; and C. Li and B. Lehmann for their editorial handling and reviews. This work was funded by the Canadian Research Chair in Magmatic Metallogeny and NSERC Discovery Grant.